If there’s one thing we love, it’s a good meteor shower from an obscure and defunct constellation. Never heard of the Quadrantids? It may well be because this brief but intense annual meteor shower occurs in the early days of January. Chilly temps greet any would be meteor watchers with hardly the balmy climes of showers such as the August Perseids. Still, 2014 presents some good reasons to brave the cold in the first week of January, to just possibly catch the best meteor shower of the year. The Quadrantids – sometimes simply referred to as “the Quads” in hipster meteor watcher inner circles – peak on January 3rd around 19:30 Universal Time (UT) or 2:30 PM Eastern Standard Time (EST). This places the northern Asia region in the best position to watch the show, though all northern hemisphere observers are encouraged to watch past 11 PM local worldwide. Remember: meteor showers are fickle beasties, with peak activity often arriving early or late. The Quadrantids tie the December Geminids for the highest predicted Zenithal Hourly Rate (ZHR) for 2014 at 120. A 2012 Quadrantid meteor in the bottom left side of the frame. (Photo by Author). Though the Quads are active from January 1st to the 10th, the enhanced peak only spans an average of six to ten hours. Though high northern latitudes have the best prospects, we’ve seen Quads all the way down in the balmy January climes of Florida from around 30 degrees north. Rates for the Quads are typically less than 10 per hour just a day prior to the sharp peak. The moonless mornings of Friday, January 3rd and Saturday, January 4th will be key times to watch. The radiant for the Quads stands highest just hours before local sunrise. So, what’s up with the unwieldy name? Well, the Quadrantids take their name from a constellation that no longer exists on modern star charts. Along with the familiar patterns such as Leo and Orion, exist such archaic and obscure patterns as “The Printing Office” and the “Northern Fly” that, thankfully, didn’t make the cut. Quadrans Muralis, or the Mural Quadrant, established by Jérome de Lalande in the 1795 edition of Fortin’s Celestial Atlas was one such creation. A mural quadrant was a large arc-shaped astronomical tool used for measuring angles in the sky. Apparently, Renaissance astronomers were mighty proud of their new inventions, and put immortalized them in the sky every chance they got as sort of the IPhone 5’s of their day. The outline of the Mural Quadrant against the backdrop of modern day constellations. (Photo and graphic by author). The Mural Quadrant spanned the modern day constellations of Draco, Hercules and Boötes. The exact radiant of the Quads lies at Right Ascension 15 Hours 18’ and declination 49.5 degrees north, in the modern day constellation Boötes just 15 degrees east of the star Alkaid. The parent source of the Quadrantids went unknown, until Peter Jenniskens proposed that asteroid 2003 EH1 is a likely suspect. 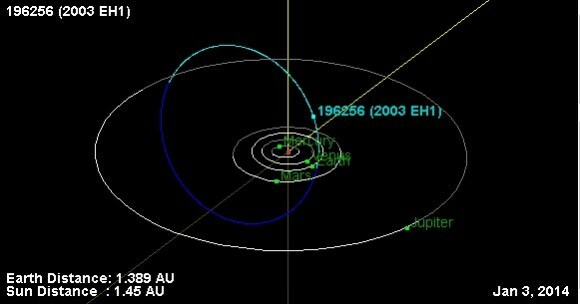 Possibly an extinct comet, 2003 EH1 reaches perihelion at 1.2 AUs from the Sun in 2014 on March 12th, another reason to keep an eye on the Quads in 2014. 2003 EH1 is on a 5.5 year orbit, and it’s been proposed that the asteroid may have a connection to comet C/1490 Y1 which was observed and recorded by 15th century astronomers in the Far East. The Quadrantids were first identified as a distinct meteor shower in the 1830s by European observers. Owing to their abrupt nature and their climax during the coldest time of the year, the Quadrantids have only been sporadically studied. It’s interesting to note that researchers modeling the Quadrantid meteor stream have found that it undergoes periodic oscillations due to the perturbations from Jupiter. The shower displays a similar orbit to the Delta Aquarids over a millennia ago, and researchers M. N. Youssef and S. E. Hamid proposed in 1963 that the parent body for the shower may have been captured into its present orbit only four thousand years ago. The orbital path of Amor NEO asteroid 196256 2003 EH1. (Credit: NASA/JPL Solar System Dynamics Small-Body Database Browser). 2003 EH1 is set to resume a series of close resonnance passes of Earth and Jupiter in 2044, at which time activity from the Quads may also increase. It’s been proposed that the shower may fade out entirely by the year 2400 AD. And the Quadrantids may not be the only shower active in the coming weeks. There’s been some discussion that the posthumous comet formerly known as ISON might provide a brief meteor display on or around the second week of January. Be sure to note any meteors and the direction that they’re coming from: the International Meteor Organization and the American Meteor Society always welcomes any observations. Simple counts of how many meteors observed and from what shower (Quads versus sporadics, etc) from a given location can go a long way towards understanding the nature of this January shower and how the stream is continually evolving. Stay warm, tweet those meteors to #Meteorwatch, and send those brilliant fireball pics in to Universe Today!